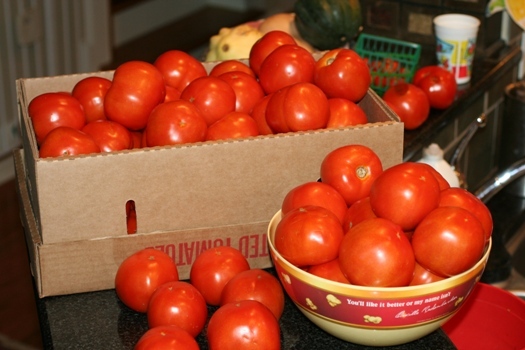 I was able to get over 40 lbs of organic tomatoes from Delvin Farms, my local CSA (Community Supported Agriculture) for $50. That is $1.25/lb and a GREAT price for organic tomatoes! I am not a canner, so I had to find a better way to put these up. Salsa was a no brainer, but the rest of the tomatoes…what would I do? Since I don’t can, I decided to just freeze them whole and the rest I diced and froze so I can make salsa later. I took my Tomatillio Salsa Recipe and made it without the tomatillios and it was still FABULOUS! 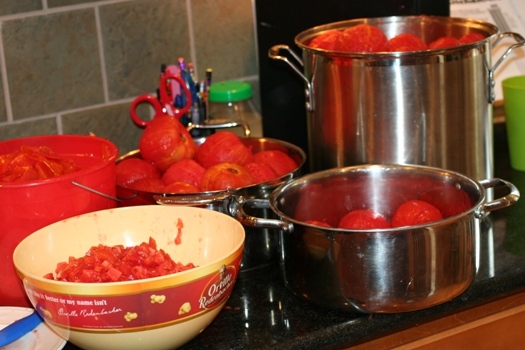 Okay, so here is my process to peel and freeze 40 lbs of canning tomatoes. 1. 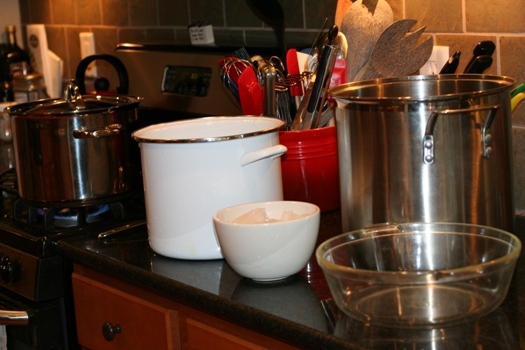 Assemble 4-6 large containers and pots to make stations for: boiling, a cold bath, transition bowl, slop bucket for peels and then a final bowl for tomatoes ready to store. 2. Heat a large pot 2/3 full of boiling water. 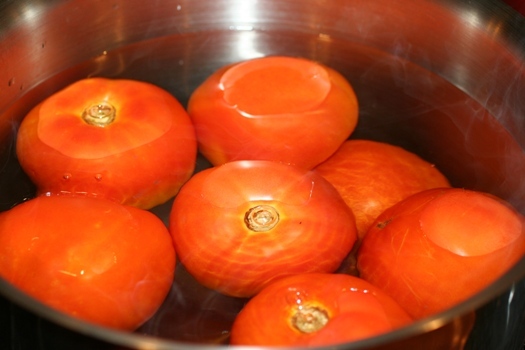 Gently drop 6-8 tomatoes into boiling water. Let them boil for 1-4 minutes, depending on the thickness of the skin. My tomatoes had very thick skin, so I kept them in around 4 minutes, but my garden tomatoes only need a minute since they have a VERY thin skin. 3. Remove and place into an ice bath. To make an ice bath, fill a large pot half full of water and add 3-4 cups of ice. This stops the cooking process. 4. Once the cool down, remove and peel the skins off. By this point many will already have a crack, a natural point to peel. If not, just take a sharp knife and cut into the skin to start the peel. 5. Place all tomatoes into a large pot until all are done. Then, half each tomato and remove stem core. 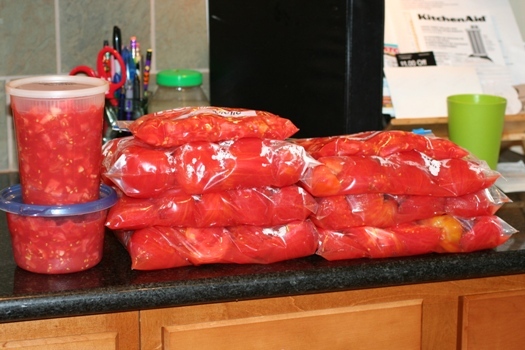 This is what 40 lbs of peeled tomatoes looks like, plus a large recipe of salsa! 6. 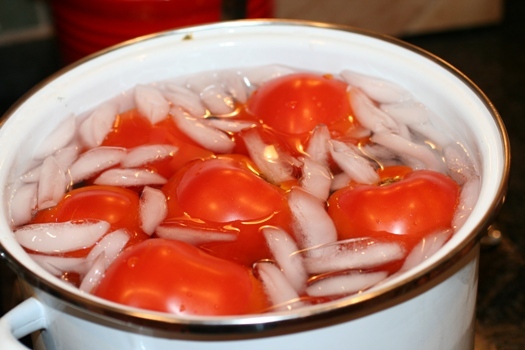 Carefully place whole tomatoes into gallon freezer bags and remove all air. Be sure not to fill them too full, so they won’t bust open while freezing. I got 6 gallon bags, 1 doubled batch of salsa, and large containers of diced tomatoes. Any tips to put away bulk tomatoes? I’d love to hear your ideas or tips. You can core your fresh tomatoes and freeze them whole. 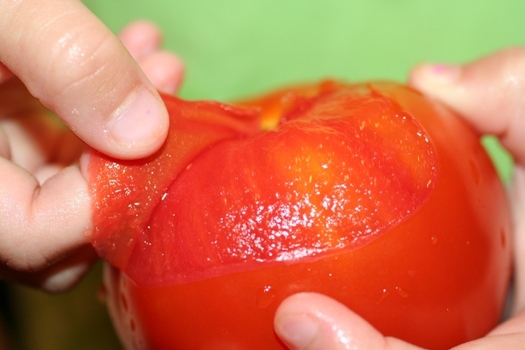 To thaw, run hot water over the frozen tomato to release the skin. 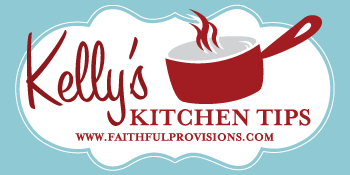 This is a time saver when you have a busy harvest season but more time to spend in the warm kitchen in the winter. 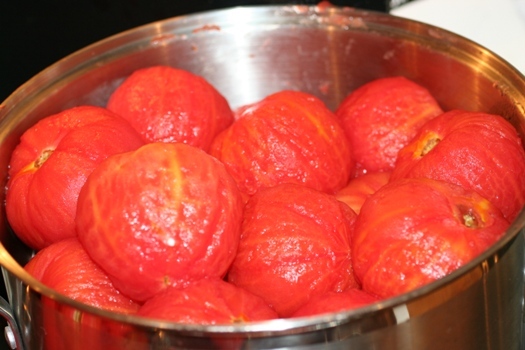 Tomatoes can be pureed in the Vita Mix with the skins on and put through a sieve before cooking down for sauce. A friend told me that canning tomatoes was as simple as placing them, after the boil bath, into jars and putting the lid on. She said the steam from the tomatoes would seal the lids on their own. I am not sure if this works, as I have not tried it. But I do save any glass jars throughout the year to use for canning things because as long as the lid still pops when you press down on it, it should still work to seal things!! Canning tomatoes is easy! It’s the only thing I know how to can. You cook down the tomatoes and they do seal the cans. We use canned tomatoes all winter long to make spaghetti sauce and it’s super yummy! I freeze tomatoes whole on a cookie sheet, them drop into freezer bags. I take a few out to thaw each time I make spaghetti or chili. After running through the Vita-Mix, nobody notices the skins. I figure it is added fiber if nothing else & it saves me time when the harvest is plentiful!